I know it’s spring, but I forgot to post this blog–this is the last snowstorm of the winter–got about five feet in Februrary and temperatures to 5F. Here’s the house with the new roof!!! I had to prop up the eaves. Here’s a typical winter commute–taken by my neighbors as we cross paths to Petersburg, about 1 1/2 miles away. You can see our house right over the boat. Take note of the snow on the top of the netshed roof–when this slides, you do not want to stand underneath! I’ve been buried in an avalanche and this one would kill you. 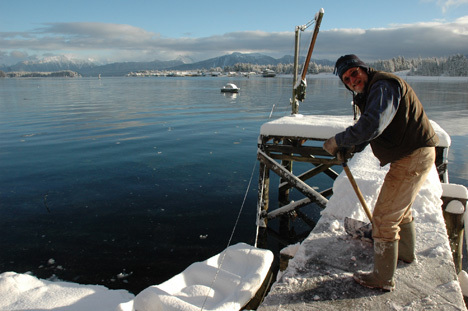 We’re relocating the boardwalk away from this eave–ditto the out-haul line to the skiff. 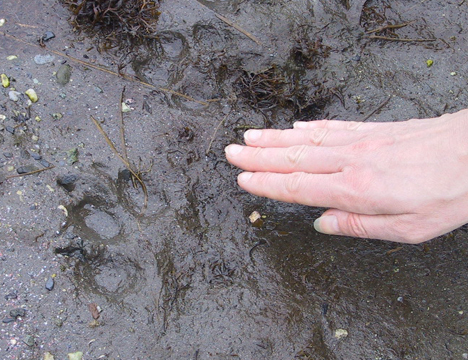 After shoveling snow, we usually take a walk around the property–here’s more wolf tracks on the beach. The wolves run after the geese that winter here. Stay tuned….. This entry was posted on Saturday, April 5th, 2008 at 5:52 pm	and is filed under Alaska. You can follow any responses to this entry through the RSS 2.0 feed. Both comments and pings are currently closed.